Global energy balance | How do YOU think this works? Find more about the environment. How does global energy balance work? Unless the temperature of the earth and atmosphere is changing, the energy flow into and out of our entire ecosystem balances. That means the input from the sun equals the heat lost to outer space at all times. We know that is never the case, not perfectly. But what has come to our attention over the last quarter-century or so is a net upward temperature change on earth that we call global warming. We've apparently lost our global energy balance. The temperature has risen slowly because the solar energy received from the sun slightly outweighs the radiative output from the earth-atmosphere system. When we have a global energy balance, we can call this a state of equilibrium. Equilibrium occurs when the total of incoming energy is equal to the total outgoing energy, resulting in no net change. Is that good? Is it normal? Global warming occurs when the incoming energy from solar radiation exceeds the outgoing energy. And it's no longer in balance. Many researchers have attributed this imbalance to changes in the atmosphere not allowing long-wave radiation to escape from the land and water surfaces, as well as from the air itself. Over time this heat builds up and manifests itself as a temperature increase. Over a period of millions of years, the earth has had its energy in balance. 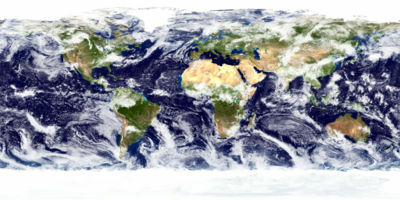 In other words, there has been no lasting significant change in the earth's average temperatures, even though there have been times when the global temperatures have been much higher or lower than at other times. The system eventually returns to a reasonable global energy balance, like that needed to support life. What normally happens to incoming solar energy? About 30% reflects off the earth and atmosphere without leaving any heat behind. 26% from the air and clouds and 4% from the land and water surface. The other 70% becomes ours for a while. But it all goes sooner or later. 6% from the ground (and ocean) and the other 64% from the atmosphere (and clouds). 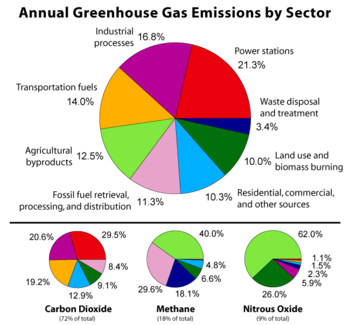 Greenhouse gases and global energy balance? They make slight changes to this delicate balance. Enough to produce a pronounced effect. These gases effectively keep the precious heat near our terrestrial surface and make survival possible. The temperature on the surface of the moon, for instance, drops to -171°C during a lunar night. And it would here too without the greenhouse effect we have. What is the most powerful greenhouse gas helping us keep our energy in balance? Water vapour. It can contribute up to 70% of the blanketing around the planet. Carbon dioxide, the gas that gets all the headlines, comes in a distant second at less than 30%. The others, methane, ozone, hydrocarbons, and nitrous oxide to list a few, total about 16% or so. Why so much variability? Because the amount of water vapor changes so drastically from day to day in some places. Most of the other earth atmosphere gases remain relatively constant. The atmosphere is 99% nitrogen and oxygen in diatomic form. Apparently they contribute nothing to the green house effect and do not affect this energy balance in the same way as the GHG's listed above. This is a fragile world we live in. Or is it? Go back from Global Energy Balance to the Solution Global Warming webpage.